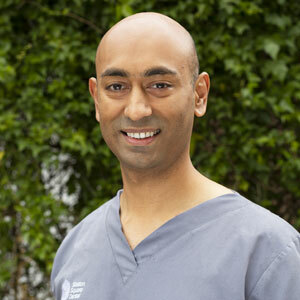 Dr Ronak (Ron) Patel graduated from London’s prestigious Guy’s, King’s and St Thomas’ Dental School in 2003, before working extensively in private dental practices throughout the UK. Drawing on his impressive experiences as a dentist, he decided to establish his own practice with his wife Priya, who is also a dentist. Ron and Priya then immigrated to Melbourne in 2011 where they joined the East Melbourne Dental Group. With their unparalleled experience in dentistry and passion for providing the highest quality of health care, the practice soon became the most reputable of its kind within the city. While Ron is experienced in all facets of dentistry, his advanced training and qualifications allow him to specialise in fields such as endodontics (root canal therapy), implants, cosmetic dentistry, facial rejuvenation, adult orthodontics, worn teeth, and CEREC CAD/CAM technology. Ron is one of Australia’s top Inman Aligner providers, whilst providing Inman Aligner training for his fellow dentists. He is also licensed and experienced in services such as Invisalign, ClearCorrect, and Smile Aligner. Ron is also proud to be the first Dental Phobia certified dentist in Australia, allowing him to effectively manage and treat patients suffering from mild to severe dental anxiety. Along with his specialist qualifications in several areas of dentistry, Ron also has a passion for facial aesthetics. He has trained extensively with Dr Brian Franks in the UK and AADFA in Australia, making him highly skilled in providing dermal fillers for lip enhancements and nasio-labial folds, as well as anti-wrinkle injections for wrinkle reduction. When Ron isn’t busily working away at Station Square Dental, he enjoys spending time with his wife and three young children. Get to know more about Ron when you book an appointment with us!